Rev. Gillam asks for a donation to build a Manse for a preacher. 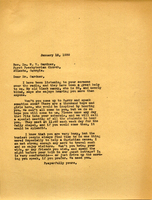 F. E. Woodruff writes to the "Principal" of the Berry Schools on behalf of his church in Germantown, Pennsylvania. He enquires after the moral fortitude of the Rev. 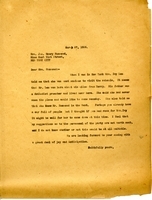 Mr. Curley, formerly of the Berry Schools, which has been put into question by rumors started upon his consideration for their pulpit, primarily as the result of a favorable letter from the Dean of the Berry Schools. Mr. Woodruff presents three questions to this "Principal," concerning Mr. Curley's morality, and he requires answers if not from the "Principal" then from someone equally informed on the subject. He adds that Mr. Curley insists that the reason for his dismissal from the Berry Schools was "the jealousy of Miss Berry, who was unwilling for anyone but herself to raise funds for the support of the schools." Martha Berry suggests that Mrs. Hammond bring Mrs. Ivy Lee on the pilgrimage to The Berry Schools because Mr. Lee was born in the area and Mrs. Lee has wanted to visit.